Just down the street from Berlin’s Tempelhofer Park – an expansive public part that was once the city’s main airport – it might be easy to pass by the modest Aviatrix Atelier without knowing what’s brewing inside. Its name invoking the adventurous spirit of female pilots, Aviatrix is a vibrant little social club, an evolving all-ages studio, gallery, and café organized by and for creative parents and their families, as well as the local community. When designer and artist Renata Faccenda first became a mother, she realized that bringing her baby into a typical shared studio cooperative just wasn’t going to work. Instead, she joined forces with other mother-artists in the city to make something new. 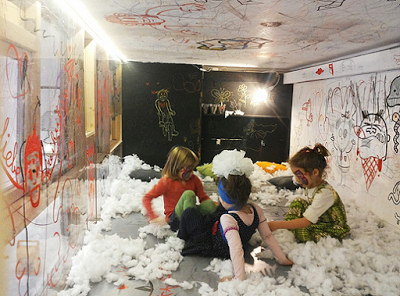 After some early attempts at configuring child-friendly collaborative spaces with others she met Sarah Salters, a clothing designer and teacher who shared her vision for an all-ages studio with space for work, play, and public events. The duo secured a multi-room storefront space in the Neukölln neighborhood, and Aviatrix Atelier was born. I felt lucky to experience the magic of this place during a solo show of my work there this fall. It felt even luckier to get to share it with my four-year-old daughter. To be sure, Aviatrix is a pretty cool place for adults to hang out, but Renata and Sarah are also deeply invested in the creativity of children: all exhibiting artists are asked to lead low-cost workshops for kids, part of the atelier’s multifaceted children’s studio programming. 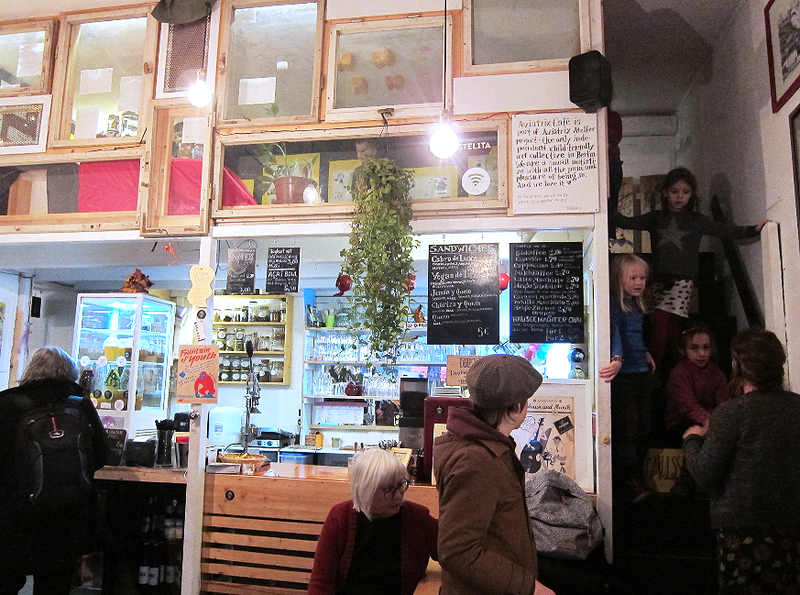 A kid-height mezzanine gallery built over the coffeeshop is the perfect space for young creatives to showcase their art for the public, curate their own exhibitions, or (between exhibitions) just contribute to the washable graffiti covering the mini-gallery’s ceiling and windows, while keeping an eye on their parents in the café below. 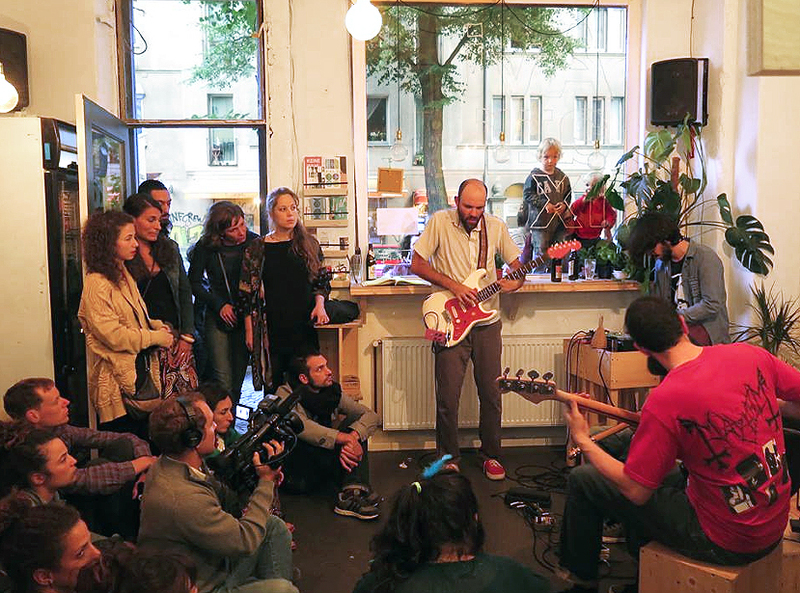 Berlin is a pretty special city in its approach to integrating family life into the larger culture: childcare is affordable for all, playgrounds double as sculpture parks, and there’s an amazing array of “Eltern-Kind-Cafés,” relaxed coffeeshops and restaurants that include built-in sandboxes, toys, or indoor slides, and even playgrounds with adjacent beer gardens (a concept we can only fantasize about in the US). Still, what Aviatrix offers is unique. 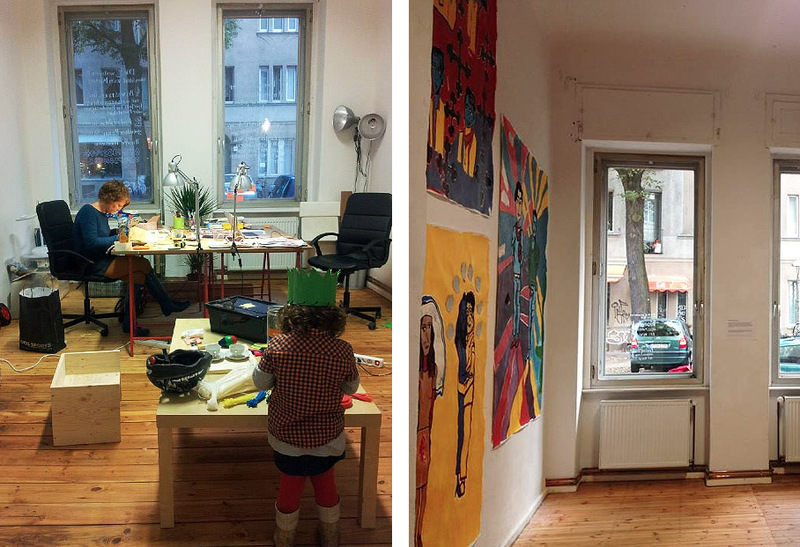 Billed as “Berlin’s only kid-friendly atelier,” it’s not just for families, but truly supports artists of all ages. For more photos, videos, and news about events past and present, check out Aviatrix’s Facebook feed and explore their website for more information. Balloons – Tartaruga Feliz Solo Show from Tartaruga Feliz on Vimeo. This essay (first published February 23, 2016) is presented here in partnership with Cultural ReProducers.